Find and fix open source vulnerabilities and generate comprehensive inventory and license reports of all open source components in your build. Some Visual Studio subscriptions include six months of free access. 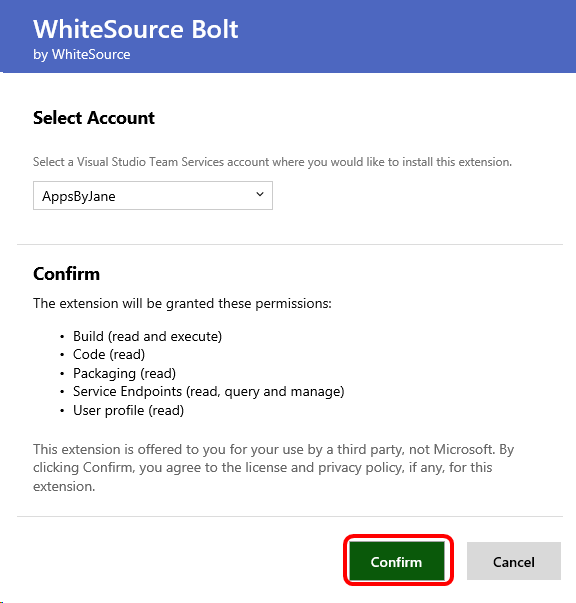 To activate your WhiteSource Bolt benefit, sign in to https://my.visualstudio.com/benefits . Locate the WhiteSource Bolt tile in the Tools section, and click on the Get Code link at the bottom of the benefit tile. You’ll receive a notification displaying your activation code. Copy the code to your clipboard, then click Activate. 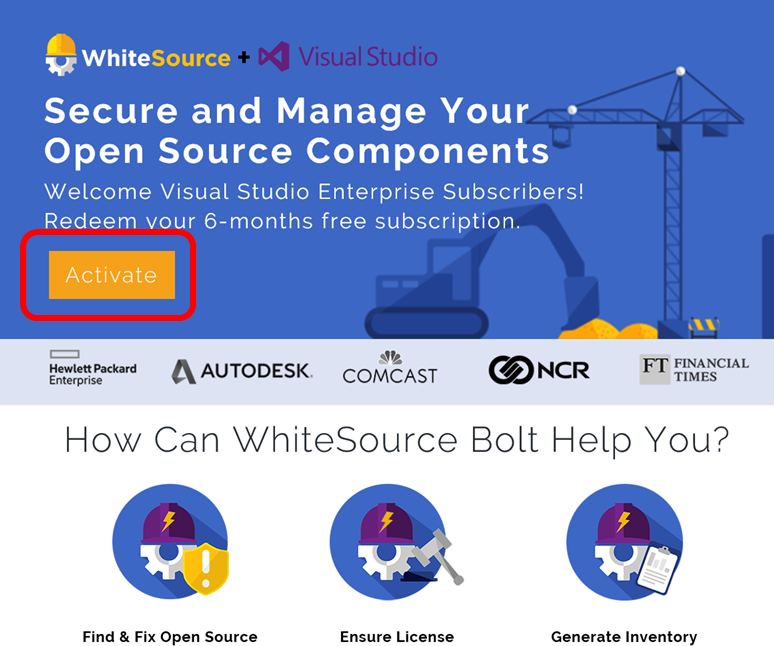 On the WhiteSource web page, click on the Activate button or scroll down to the Activate your account section of the page. 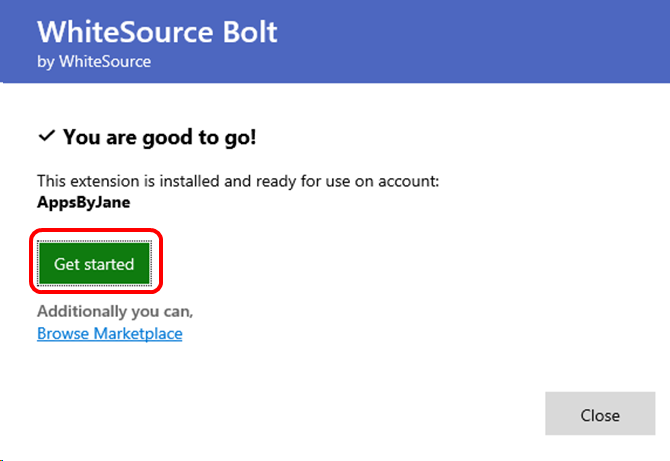 Install the WhiteSource Bolt extension from Microsoft Visual Studio marketplace. If you don’t have permissions to install extensions, see Install free extensions for Azure DevOps Services. Click the green Install button if you are using Azure DevOps Services, or the Download button for Team Foundation Server. For this example, we will use Azure DevOps Services. You’ll receive a confirmation that the extension is installed and ready to use. 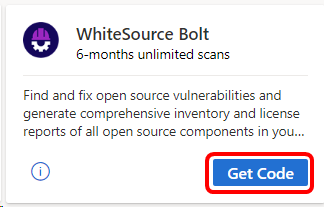 Click Get started to return to the WhiteSource Bolt page and continue. Open your Azure DevOps project dashboard, click on the Azure Pipelines menu and choose WhiteSource Bolt. Paste the activation code from the WhiteSource Bolt benefit tile and click Activate. Each of your activation codes can be used to activate only one project. Your activation is now complete, and you will have 180 days remaining on your subscription. You’ll need to add the WhiteSource Bolt extension as one of your build steps. A video is available on the WhiteSource Bolt page to show you how. 1 Includes: Microsoft Partner Network (Enterprise). Excludes: Other Not for Resale (NFR), Visual Studio Industry Partner (VSIP), FTE, MCT Software & Services Developer, BizSpark, Imagine, Most Valuable Professional (MVP), Regional Director (RD), MCT Software & Services, Microsoft Partner Network (Professional).